Right Or Wrong? What Saith The Scriptures? In 1960 alone there were 1.6 million abortions in the United States. Since 1973 there have been over 35 million babies aborted in America. This is an average of 1.5 million abortions a year. It has been referred to as "The American Holocaust". And the debate continues - Is it all RIGHT or is it WRONG? For most politicians and many churches alike it is a 'hot potato', with most people, including William Branham, having definite opinions on the subject. While politicians and the clergy discuss it from a moral standpoint, the courts are trying to make legal decisions for or against the 'rights' of the fetus, attempting to determine whether or not it is "a person" while still in the womb. Neither group (the Politicians, the Preachers, or the Court Judges) have ever been able to unanimously come to an agreement on this very important subject. For the non-Christian the debate will go on till the end of time BUT for the Christian, the statement of Scripture puts an end to all debate. The Bible is their absolute in this and ALL other matters. Their opinions and decisions concerning abortion is a matter of Faith (revelation (understanding) in the heart) rather than feelings and intellectual reasoning. Therefore, what exactly can we find in the Bible that will settle for the Christian the issue on abortions. Let's search the Scriptures and see what God has to say about the "unborn" while it yet remains in the womb. Without a doubt the Bible will show God's attitude toward what is commonly called 'the fetus'. I challenge all readers to lay aside all 'self-conceived' intellectual and emotional ideas and receive the testimony of Scripture. Man would multiply and replenish the earth through a union with the woman. Multiplied sorrow and suffering in pregnancy, bringing forth with pain would be synonymous with birth. A constant reminder of "original sin". But thus it is ordained that the woman should conceive and bring forth children. She would according to the original command multiply and replenish the earth BUT through sorrow and pain. With the coming in of the Law the woman with child is taken under the special protection of the law of God. To protect the unborn 'child' or fruit of the womb from a mis-carriage brought on by the actions of man, God brought in a Law with penalty of punishment (a fine) to be determined by the father of the child. In light of this Scripture what does God think of the hundreds of thousands of (not accidental or spontaneous) but deliberate abortions performed each year around the world? What punishment would He exact upon the woman, the Doctor and the man who gives consent for it? In the Scriptures we notice the particular care which the Law took of 'women with child', that no hurt should be done which might occasion their 'miscarrying'. The law of nature obliges us to be very tender (careful), lest the tree and the fruit be destroyed together. Note also that the Lord did not determine the punishment according to the "stage of development" of the fetus - it just states "a woman with child", regardless, whether it be 12, 16, 18 or 24 weeks, etc..
What a statement!!! 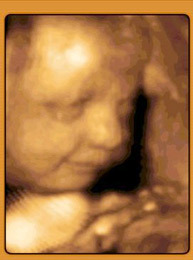 BEFORE the child was formed in the womb God KNEW the child. BEFORE he/she came forth out of the womb, he/she was already ordained to serve God's purpose in the earth. God, in His great Omninescience, knew every child that would be "conceived" by woman in the earth. The above Scripture proves that God KNEW of the child BEFORE it was brought to birth. The testimony of Ishmael and Isaac and Jacob and Esau show that God knew the predestinated plan for each child's earthly pilgrimage before they were born. Therefore, wherein is the choice of the man and woman concerning the birth of the child? Their choice is before conception. They can chose to have or not have a child BUT once it is conceived in the womb they do not have the right to abort that child - ALL 'life' comes from God. "Life" is in His hands. Taking into consideration the spirit of the Scriptures and the character of God, we know that in circumstances wherein the life of the mother is in danger, then God would spare the 'tree' and allow the 'fruit' to be cast forth before it's time. There would be the possibility of the 'tree' bearing fruit the next season. According to the Scripture mentioned above, there was a fine enforced if the fruit of the womb was lost. But if the woman lost her life then the judgment was 'life for life'. I stood not long ago by the side of a man that was dying, who refused Christ. He was screaming and pull, "Get those demons away from me. They're wrapped in chains. Don't let them get me." I stood by an old woman's side who had abortion cases, killing little children. She said, "Oh, cold baby's hands are running through my hair." She said, "Let that stork away from the window there with those great big heads on it." Brother, I seen a man who'd shot another one, calling of his blood on his hands. But he was standing before God then. I've heard people say, a lot of time, "What is the unpardonable sin, Brother Branham?" My mother used to tell me that it was a woman that would take the life of a baby before it was born - abortion case. Well, She said, "She has done something. She didn't give the little fellow a chance to live." Well, that's awful. I'll admit that. Here not long ago, I met a woman that had committed some of those cases, practicing birth control. That's the disgrace in America. This may kindly singe you a little bit, but watch it..... These American people will practice birth control, and give a hundred dollars for a little old dog, and pack it around, and give it the love of a baby. It's a disgrace. But that's right. Yes, it is. You know that's the truth. Will lead him (the dog) down the street with a little jacket on him, when he is nothing but a dog. That's right. But you wouldn't have the baby. Because you're afraid you would deprive yourself of something. God commissioned women to bring forth children. That's exactly right. It used to be it was a wonderful thing. Nowadays, it's a disgrace. Too much time. That's right. You have to have time for your social life, you've got to go out to gatherings. You've got to do this, got to go at the card party. Right here in Chicago, according to your paper, you have two thousand abortion cases every day, two thousand abortion cases. Two thousand innocent babies die every day because of filth. How can you have a revival under them kind of circumstances. I read in the paper the other day, I forget... It's thirty thousand abortion cases per month, done, recorded in the city of Chicago. How many is not recorded? Thirty thousand abortion cases, my, my. What's going to happen, brother? Think of the world over, what's going on at this time, sin. Oh, it's horrible. William Branham made these and other statements almost 40 years ago. What would he say today, considering that "Abortion Clinics" are increasing all over the world and many Politicians and Professionals in all walks of life are pushing 'the woman's RIGHT' to abortion. That's what Satan pushed over on Eve in the Garden of Eden - insisting that God, in not allowing her access to the "tree of knowledge of good and evil", was depriving her of her "right" to 'know and do' certain things. Eve fell for the Devil's "intellectual reasoning against the Word of God".